I picked this up at the church rummage sale last weekend before it got thrown in the dumpster with other unsold items at the end of the day. 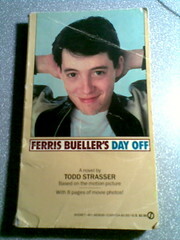 Yes, that is the official novelization of Ferris Beuller’s Day Off. It was just too campy a find to let go. At some point I might even read it, considering I’ve never seen the film in its entirety beyond snippets seen through peripheral vision on a TV in the same room while I was doing something else.